Epoxy Floor for a custom home in Boothbay Harbor, Me. Bill was great to work for, very accommodating to our needs and very helpful getting the two areas clean so we could finish on schedule. 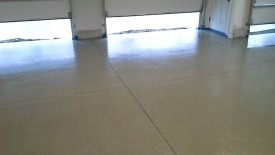 Bill wanted an epoxy painted floor in the garage and mechanical room because they are very durable floors that look great and are easy to keep clean. We decided on an epoxy floor with the decorative chips broadcast into it. 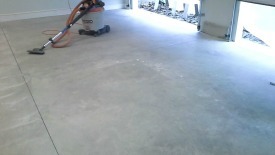 The chips help strengthen the epoxy and give the floor a nice look with some slip resistance. Bill wanted the floor to kind of blend in with the beautiful stone veneer on the outside of the garage. After doing some samples, he chose a solid color system in the grey family of chips called TABU. I think he was spot on with his choice, the greyish color chips really complemented the colors in the stones. The house Bill is building looks amazing. To me, it looks like his crew is very experienced and detail oriented. They were in the finishing stages when I was there and the trim work, cabinets, painting, and tile looked fantastic.